Here you can find a variety of Caligraphy essentials, as well as a Large Collection of Chinese Language Photo-Books, literature on the Arts in General, postcards and the Like. Please do not worry - The store also holds plenty in the English language. Just look around or ask for the "Foreign Language" department. Here you will find a rather large collection of English Language Books, again on Arts, History, Traditional Painting & Caligraphy , and of course books with the best photos from around China. A Treat to the eye and true Booklover ! We wish you a joyful time browsing around. Mind you - this is more rare, but sometimes French- and German- language books can be found. Most books are printed in China and therefor quite rare for International Travellers. Continuing down Liu Lichang Street stores start to diminish in size and stature. Find many more stores and stalls selling lesser quality products, and .. yes the occasional Jewel. From here on you are on your own to Discover as there aren't many more details or highlights to Report on. 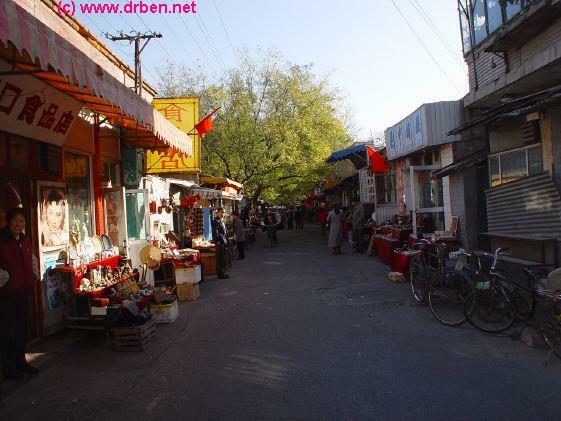 As the Restored Traditional Shopping Street starts to fade into a more Hutong like surroundings , Liu Lichang West Street gives way to Liu Lichang Market. Here you'll find smaller sized box Like family stores and a series of stalls selling smaller items. Buy cheap little statues, a profusion of now impopular Communist Era pins, and the Famous Little Red Book (Of Mao) from the Communist Revolution Era. If you are lucky you may find a 1st Print ! If and when one gets to Liu Lichang West Street , one will find it is equally charming as its Eastern Counterpart across Nan Xinhua Jie'. Again - Start at the Crossing of Xan Xinhua Jie' now head West into Liu Lichang Street. 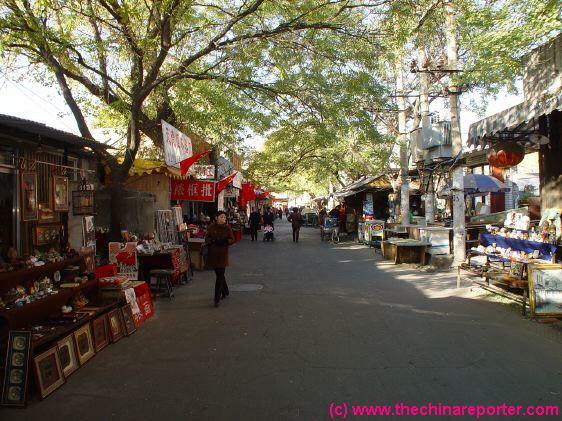 On this stretch of Liu Lichang you will find a Collection of Quality Stores catering to the Chinese Scholar, Artist, and of course to the eager Foreign Tourists. You can start immediatly at the Corner of (Nan=South) Xinhua Jie' and Liu Lichang at the Store with the eye-catching Traditionally Painted High Front (Photo Below) for your needs. View of Liu Lichang West street looking West. Continue shopping, exploring and browsing in this way as much as you like. 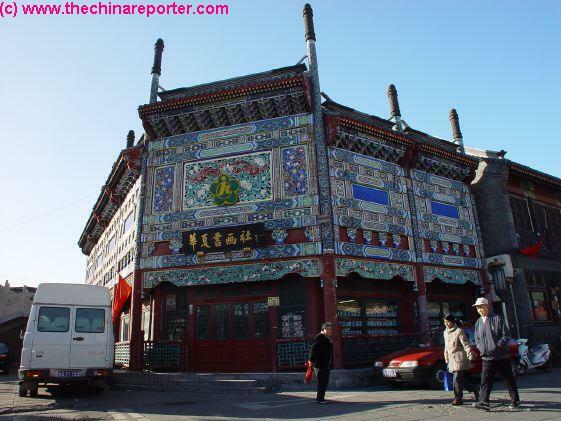 As mentioned, Liu Lichang is the Beijing Jewel of preserving Traditional Chinese Folk Art. Plenty of stores therefor abound. Again - from simple chop-making , to selling traditional Jades, Paintings, Caligraphy essentials and Art, musical instruments such as the ever-melancholic Erhu and many other Traditional Products - Liu Lichang is the Source. Look around and you will find something you like. storefront decorations in colorful painting, and traditional chinese stone cutting and woodcarving. Decorations of Little Pots with Brushes make clear this a caligraphy and painting related store, etc. Chinese signs on the Buildings are incomprehensible if you haven't mastered the Mandarin language, yet. But not to worry - these days Each Store carries a copper plate with proper English describing the company or store housed inside. Courtesy of beijing Municipality you can also check if this is a Licensed retailer , giving you an idea of the Quality of Trade. Richly Decorated Liu Lichang Storefront with woodcarvings signifying it's function as a depot for Caligraphy, Caligraphers and painted Art. 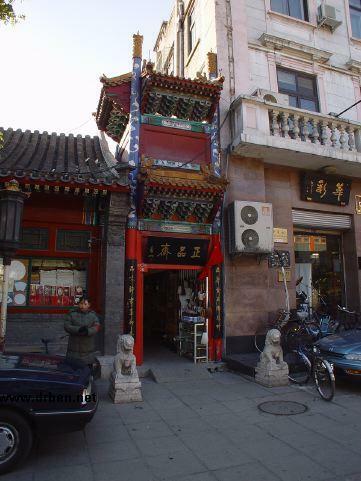 While progressing further down Liu Lichang West Street you will find many more stores. Some similar to the ones scattered around East Street, with interesting and often delightful but typically doubtful "Antiques" and a variety of Kitch and Kitsch-like items. 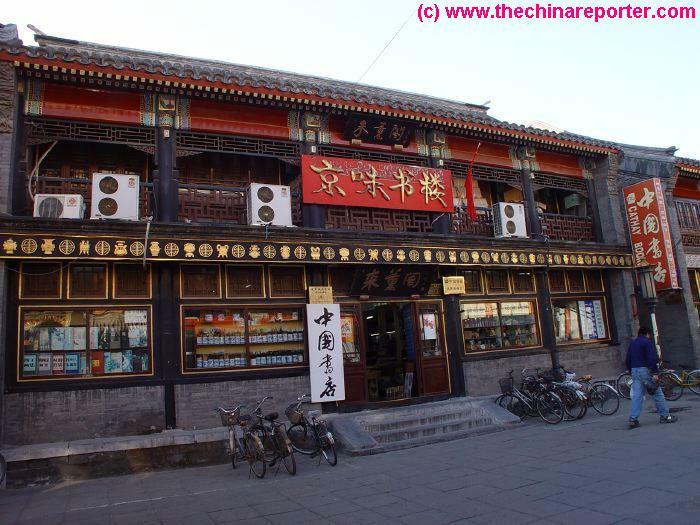 These stores are too many too mention and we refer to the rather typical Yan GuiPing Antiques as an example. 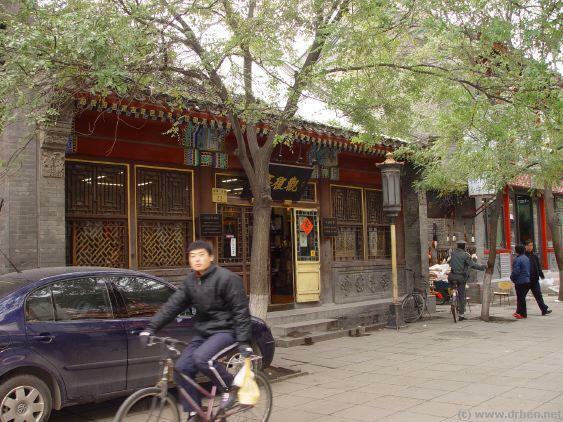 Other stores are much more noteworthy, such as The Historically famed Cathy Bookstore, which was for a long Time one of very few Foreign Language Bookstores in Beijing (other store was outlet of Beijing Foreign Language Press printing House, now at WanfuJing Dajie'). Enduring through long years of communist overtones , today the Cathay Bookstore is there ready to receive the Foreign Customer with a wide variety of rather unique (often) Chinese Printed Books, in English, German, French and sometimes other Languages. Among the subjects available are - the Arts and Photography, literature on various arts and scholars or artists, a wide variety of books on the history of China, Beijing or other Cities. Books on the rich history and heritage of chinese ceramics, paintings, silk work, Palaces, landmarks, Imperial history & families and anything else worthwhile knowing about China and Chinese Civilization during it's long history of 5000 Years. On top of all these fine works on sale, one can also aquire CD's with traditional music, opera performances and more. DVD's and Video-CD's are also coming ! Any visitor to Liu Lichang Street should have a look at Cathay Bookstore. Find the best in books, plus a variety of small artworks and a great collection of video CD's inside ! Seeking a unique but quality gift ? You might just find yours inside Here. Typical Restored Store-Front at Liu Lichang East Street. One of the smaller Stalls typical for the most western stretch of Liu Lichang Street (and other parts of China). 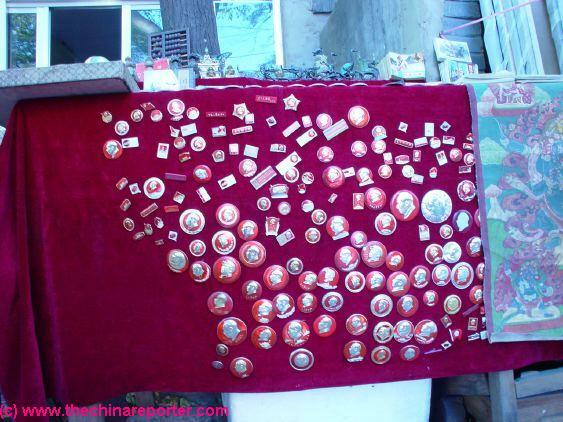 Buttons & Pins from the proud Communist Era , now on massive sale at Liu Lichang Street and other Beijing Markets. Beijing Neighborhood Police Man having a chat in fron of Guan Fu Zhai Antiques. Right next door to Cathay Bookstore is Guan Fu Zhai Classic Arts Company , one of the longer Antiques mainstays of Liu Lichang Street. Traditionally a family business , Guan Fu Zhai is a store with excellent service, and time to browse around quietly, or even get advice. Don't expect too much ! This is still a Business. However, appreciated customers certainly get a friendly chinese treat. Discuss the history and documentation of your Buy over a Cup of Fragrant Jasmin Tea , get introduced to local Family contacts for the printing of your business cards, and the like or information on the Hutong Area. 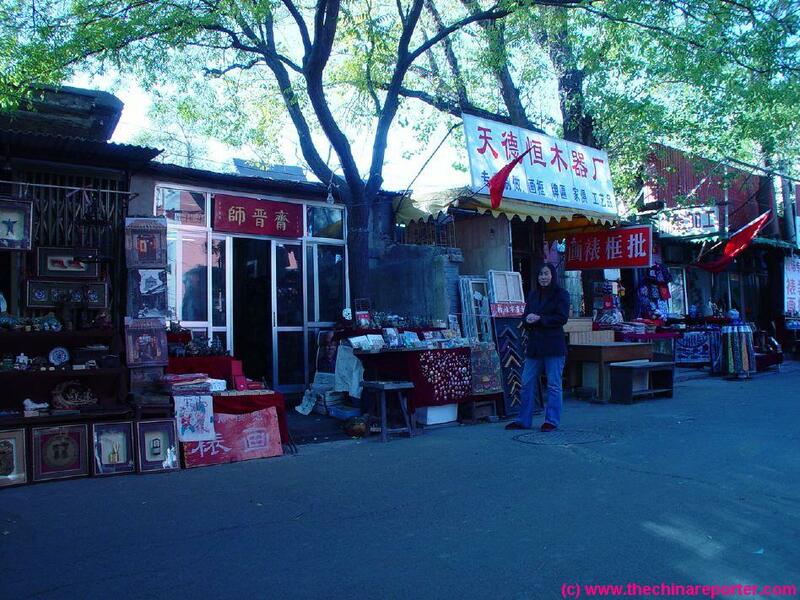 Most Importantly - Guan Fu Zhai is a High Quality Antiques Store, rare to Beijing. Guan Fu Zhai Classic Arts Company is usually worth a visit. Although not Blessed with a very Large inventory, the quality of works on display and sale can be breath-taking. Rare Jewels have been seen , available for those who can afford it ! (prices vary from 1000 yuan to much much more.) Contact info and More on the Guan Fu Zhai Page , part of this Liu Lichang Culture Street Report. This Page will include an interview with the Family, more on the History of Guan Fu Zhai and Liu Lichang Street and possibly some more of their art on sale. Interview results due in Januari 2005. Overview of the most Western part of Liu Lichang Street with restored storefronts and Family Stalls Market beyond. One of many smaller side-stores selling Caligraphy Brushes, posters, Mao memorabilia and the Like. 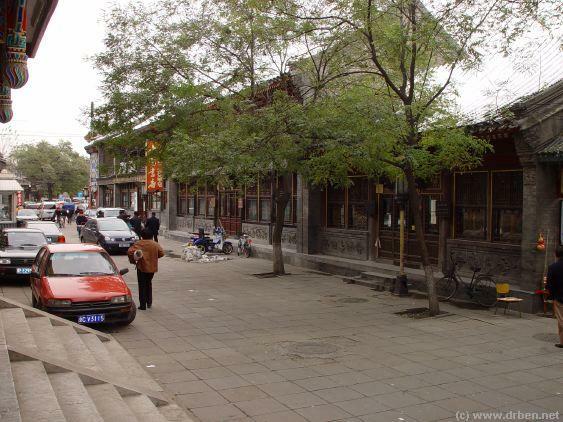 Where Liu Lichang West Street merges with the Xuanwu Hutong. Family Stalls Market at Liu Lichang West Street. Proud Female Store-owner posing at her Family Stall at Liu Lichang West Street Market. For newcomers to China this little market can be quite interesting , but .. for more advanced China Travellers it usually ends in a bore. Too many little Statues, low quality replicas, and weather exposed trading items. However, as mentioned.. you may be lucky and at the right place at the right time. You can find your unexpected Little Gem. Me myself found an old man peddling books, amidst of which a Red Book 1st print, and a unique 1960's newspaper photo of Mao Zedong giving a speech at The Great Hall of The Peoples. If Mao Memorabilia are your thing. Then .. perhaps you should spend some time here ! 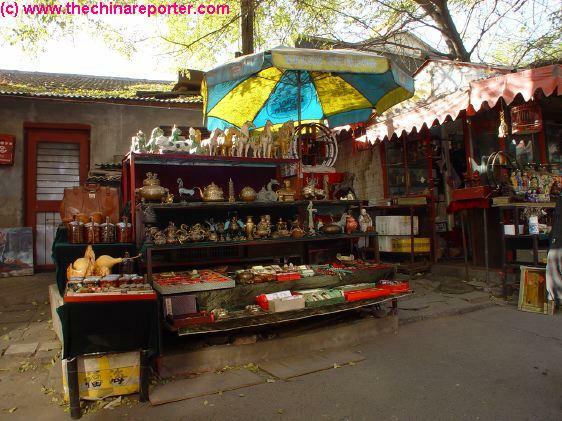 Other visitors can take heart at enjoying the atmosphere radiating from the very nearby Hutong. Normal Beijingers will pass by on bicycles, a rickshaw carries goods to & fro. Mind you, a few years after having this wonderful first experience, the news was announced to the world that Beijing was to host the 2008 Olympic Games. 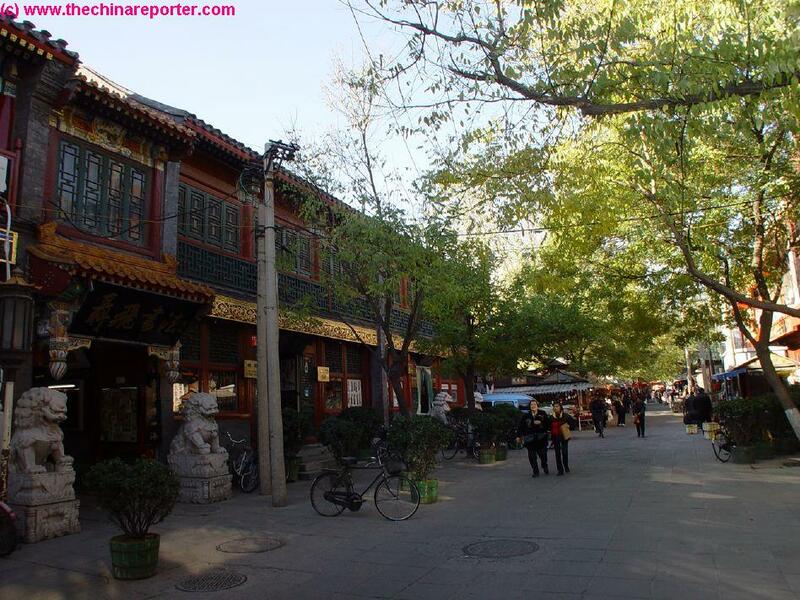 Eversince the year 2005, Beijing has seen massive development among things eliminating blocks of surrounding Hutong, a process which very much altered the atmosphere at Liu Lichang. In addition, as a renowned historic location the Culture Street was also renovated resulting again in drastic loss of character. Sadly, small stalls are no longer allowed tp peddle their wares at the back end of Liu Lichang which is now an upscale street with far less culture. Often a the smoke of coal-fires at nearby SiHeyuan Homes fills the air adding life and joy to a Liu Lichang browsing affair, albeit - it does not really enhance the air quality. 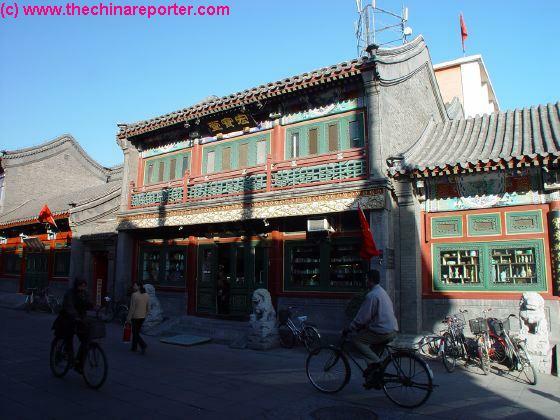 If you continue on from here you will be in the Xuanwu Hutong. If you are planning on shopping, this may not be your place to be. 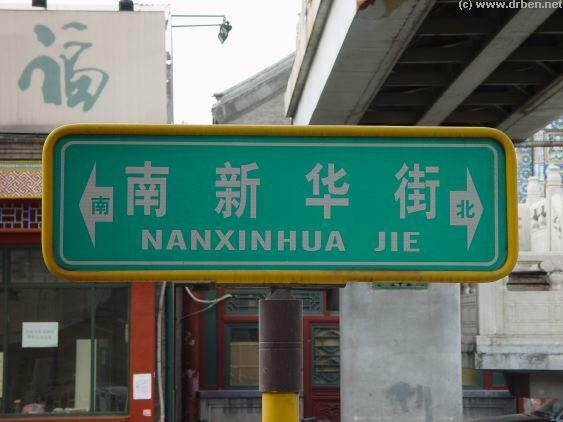 Otherwise, we highly recommend you get nosy and push on ito the Hutong. Watch your steps ! - That is .. you are not at risk of being mugged, but you may however find yourself easily lost. In the current day situation, with many of the hutong gone and english language street signs for directions seen everywhere, getting lost is now far less common among tourists dwelling in this area. 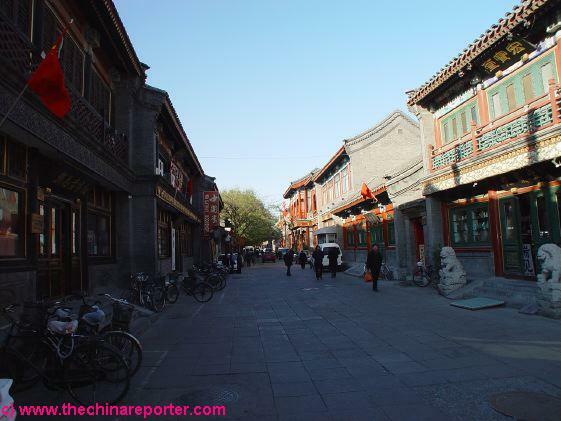 However, it is a big place so take good note of our directions as you turn left, right and again into the narrow Alley's (Alley = Hutong) awaiting you. This is a cozy and friendly neighborhood that is a pleasure to wonder in. When Lost - Keep an eye on the position of the Sun. During most of the day it will be somewhere in the southern quadrant, making direction finding easy in Beijing as larger roads and lanes are all aligned North-South and East-West due to Feng Shui (and later communist) requirements. If you keep walking straight you are bound to refind your position. Naturally, eversince the 2008 Olympic Games one may also navigate easily following the clear English language raod signs which are now the norm. The added multi-staged expansions of the subway transporation system also make getting around the city much easier, faster and also far less exhausting. For more by now historic photos and reports on Liu Lichang and surrounding Hutong check through out Beijing Pages at www.drben.net = ChinaReport.com.